This post was co-written by myself and Rob Holmes who is one half of the excellent Mammoth. You may recall Rob from earlier in the series, when he wrote about cyborg plants. We’d like to talk for a moment about an ethical dimension of cyborgs. Not the one of identity and hybridity that’s been touched on so well already in this series, nor the one of military-industrialization, but the ethical dimension of the specific aims of the first paper, which was developing ways to adapt the organism, rather than adapting the environment. Kline and Clynes were quite specific on this point. The environment with which man is now concerned is that of space. Biologically, what are the changes necessary to allow man to live adequately in the space environment? Artificial atmospheres encapsulated in some sort of enclosure constitute only temporizing, and dangerous temporizing at that, since we place ourselves in the same position as a fish taking a small quantity of water along with him to live on land. The bubble all too easily bursts. So we get cyborgs, robust self-sufficient entities that have been rebuilt and rewired to survive natively in whatever environment, or environments. Suddenly everywhere you’ve been spec’d for is comfortable. You can hang out, out there, without changing the environment. This is extraordinary, because changing the environment is what we do. As we are learning to our growing horror, changing the environment is an activity that becomes extremely perilous at scale. In light of this, the cyborgian program of self-adaptation begins to look mighty virtuous. You can imagine these herds of perfectly adapted technomads, leaving only footprints, taking only HD video streams. They pick their way over the environment, leaving it essentially untouched for the native species to flourish in peace. Why build roadways, if we can make legs that are faster than any car and decidedly more all-terrain? Why raze forests and construct shelter if we can just dial ourselves for “enjoying being pleasantly rained upon”? Cyborgs are a child of the space program and it’s fitting to that, to some degree, environmentalism is as well. The early pictures of the planet taken by the Apollo astronauts are often credited with being catalysts for their depictions of the fragility and smallness of our home. 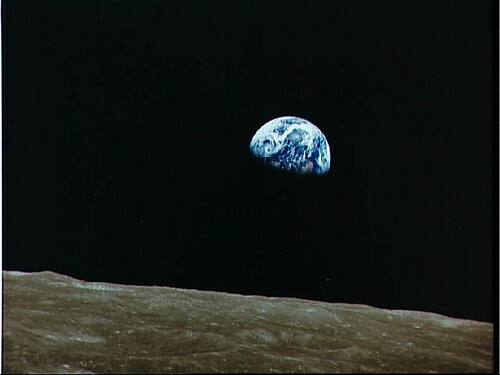 It is no accident of history that the first Earth Day, in April 1970, came so soon after color photographs of the whole earth from space were made by homesick astronauts on the Apollo 8 mission to the moon in December 1968. Those riveting Earth photos reframed everything. For the first time humanity saw itself from outside. 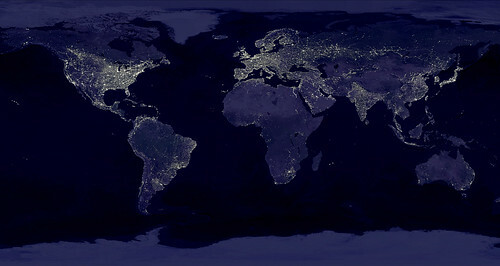 The visible features from space were living blue ocean, living green–brown continents, dazzling polar ice and a busy atmosphere, all set like a delicate jewel in vast immensities of hard–vacuum space. Humanity’s habitat looked tiny, fragile and rare. Suddenly humans had a planet to tend to. Mary Mattingly’s “Wearable Homes” is a project – part architecture, part photography, part design fiction, part clothing (fashion is not quite the right word here) – which sits at that confused junction between cyborgs and architecture. Mattingly imagines and photographs a future where ““civilization has shattered and nomadic ‘navigators’ roam the landscape“, providing some very detailed specifications to back it up. The fabric used is is an outerlayer combination of Kaiok, a phase change material like Outlast® Adaptive Comfort®, waterproof Cordura, Solarweave UV protectant fabric, and the inner muslin layer. The fabric has the ability to keep the body at a comfortable temperature no matter the weather. The encapsulated warmers (like those found in electric blankets) are also woven into the innermost layer of the home, and through sensors, are adjusted to your bodies temperature and keep the home warm or cool on the inside to counteract the outside. The electronic silver threads in the fabric connecting to the sensors (one at the wrist and one at the ear for the healthy person) will give the wearers the ability to monitor themselves, their health and introspectively study themselves, as well as monitor the outdoor conditions, and transmit information to another, currently through a ZigBee connection or secure nodal random key coding and patterning frequency that can be set up to directly interface with another person’s home and information. This infrastructure will be able to receive signals from satellite and aid in GPS, mapping VA goggles, cel-sat and Internet. Wearable Home and SurvivaBall’s response to crisis and imminent collapse lay bare the problem with a self-sufficient response to massively global problems. It is in effect a denial of any collective responsibility at all. We learn that the Wearable Homes’ Nomad Navigators may “decide to make a home separate from others — when the tides rise, the islands usually survive.” And as to the target market of SurvivaBall, far from gentle technomads, we get plunderers and pillagers, freed to exploit the environment as the mood suits, knowing that they are insulated from the consequences. Or as least telling themselves that they are as they bounce around in their bulky, damage-prone bubbles, all too easily burst.